It is no secret that a decorative, ornamental door knocker can really improve and enhance the overall appearance of an entrance door, and add substantial value onto a property. The traditional 6 inch black iron Victorian Urn Door Knocker from UAP has a classic design that is perfect for cottages and period properties, as well as large wooden doors and rustic interiors. Made from solid cast iron, the black iron Victorian Urn door knocker is durable and black powder coated to give a high quality finish. The Black Iron Victorian Urn is very easy to fit and comes with steel bolts, black washers and dome nuts. The UAP black iron door hardware range is available in a number of different products including black iron front door handles, black iron letterplates, black iron door chains and black iron door numerals. 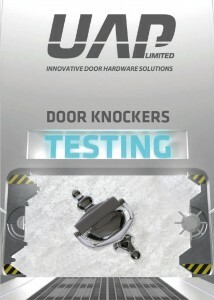 This machine tests the corrosion resistance of the door knocker and many other products. The salt spray cabinet produces a corrosive environment, by releasing a dense saline fog into the chamber which the products are exposed to. This creates accelerated corrosion to the product and allows us to test how well the product would stand up in harsher environments. 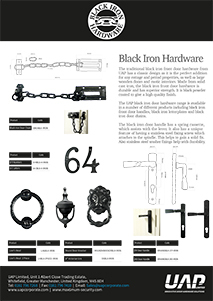 UAP Ltd distribute a wide range of black iron hardware, made from iron, including but not limited to door handles; letterplates; door chains; numerals and door knockers. 1. The black iron hardware is applied to a door or door panel, and no item of door furniture on the door or door panel are sealed or fixed using any form of silicone sealant or the like. 2. The black iron hardware is fixed correctly and the right way around using the correct fixings, and are not scratched or damaged at any time during the installation process or thereafter. 3. The black iron hardware is installed inland (defined as 25 miles from the coast or 5 miles from highly populated industrial areas) and are cleaned monthly with a moist cloth. At no point should any form of cleaning agents be used. 4. No claim will be accepted for any black iron hardware that is scratched or mutilated or fitted incorrectly. 5. The guarantee only applies if the black iron hardware is fixed to the original door for which it was bought and fitted by the installer. The guarantee will cease immediately if the black iron hardware is removed from the original door or door panel. 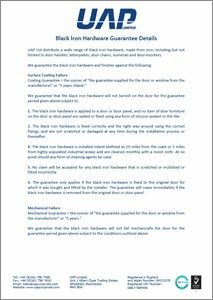 We guarantee that the black iron hardware will not fail mechanically the door for the guarantee period given above subject to the conditions outlined above.